We had more good news coming out of the New Jersey Supreme Court this morning in the other Accutane appeal that was heard earlier this year. Today’s decision addressed the applicability of New Jersey’s Product Liability (PLA) to Accutane claims consolidated in MCL in Atlantic County, and the adequacy of Roche’s warning label under the PLA. The Court held that New Jersey has the most significant interest with respect to the MCL cases and the PLA therefore applies to all cases consolidated in the MCL: “New Jersey’s interest in consistent, fair, and reliable outcomes cannot be achieved by applying a diverse quilt of laws to so many cases that share common issues of fact.” This is a reasonable rule that enhances predictability for litigation brought by out-of-state plaintiffs against New Jersey-based businesses. We are also pleased to see the Court affirm the strength of the PLA adequacy of warning, which requires a heightened standard of “clear and convincing” evidence that a label warning is inadequate, and find that Roche’s warnings were adequate as a matter of law. Today’s decision affirms the primacy of the federal regulatory process in adequacy of warnings, and ensures that our state’s pharmaceutical companies will continue to enjoy the protection of the PLA from unmeritorious product-liability litigation from out-of-state residents. This is yet another New Jersey Supreme Court decision to uphold Superior Court Judge Nelson Johnson’s analysis in the ongoing Accutane litigation. 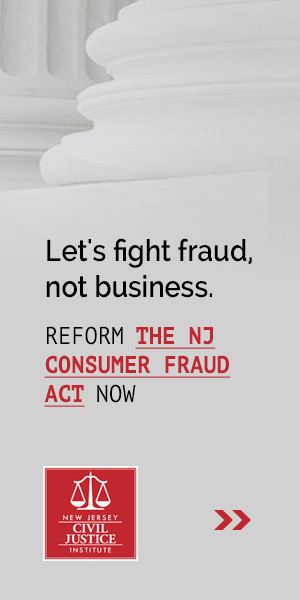 Earlier this year, Judge Johnson’s careful scrutiny of flawed expert testimony was ultimately vindicated in a decision that formally aligned New Jersey’s standard with the federal Daubert standard, consistent with repeated arguments by NJCJI.